Completed the acquisition of PBS Coals Limited (“PBS”) on August 19, 2014. Revenues of $45,150,000 for the three months ended September 30, 2014 (“Third Quarter 2014”) includes PBS from August 19 to September 30, 2014. Metallurgical coal sales of 263,000 tons and thermal coal sales of 247,000 tons in Third Quarter 2014. Sales guidance for metallurgical coal of 300,000 to 320,000 tons for the three months ended December 31, 2014. Sales guidance for thermal coal of 220,000 to 250,000 tons for the three months ended December 31, 2014. Realized average sales price of $93 per ton for metallurgical coal in Third Quarter 2014. Average cash production cost per ton of $74 per ton for metallurgical coal in Third Quarter 2014. 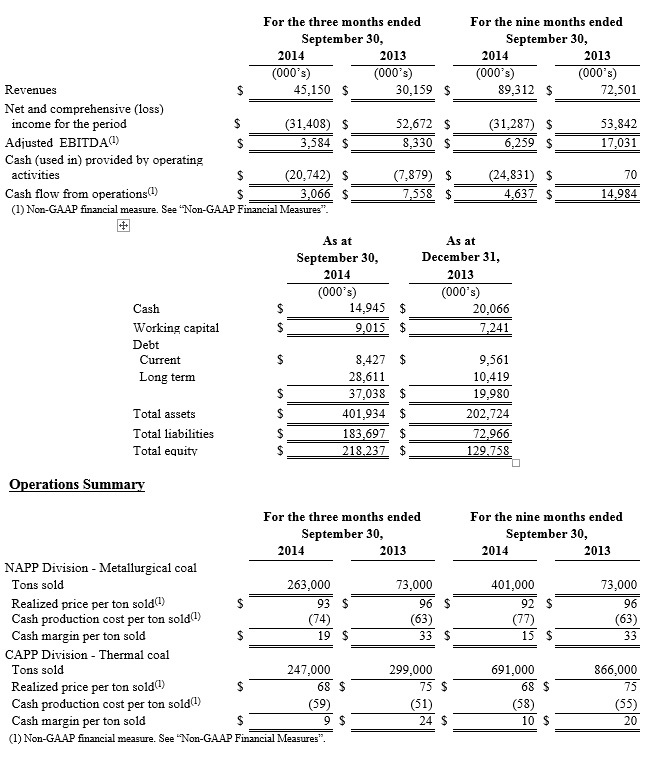 December 1, 2014 - Toronto, Ontario - Corsa Coal Corp. (TSXV: CSO) (“Corsa”), a premium quality metallurgical and thermal coal producer, today reports financial results for the three and nine months ended September 30, 2014. Corsa has filed its unaudited Condensed Interim Consolidated Financial statements for the three and nine months ended September 30, 2014 and 2013 and related Management’s Discussion and Analysis on www.sedar.com and has posted these documents to its website www.corsacoal.com. References in this news release to “Third Quarter 2014” means the three months ended September 30, 2014 and “Nine Months 2014” means the nine months ended September 30, 2014; unless otherwise noted. All dollar amounts in this MD&A are expressed in United States dollars and all ton amounts are short tons (2,000 pounds per ton). Corsa’s coal sales guidance for 2014 is approximately 1,612,000 to 1,662,000 tons. This consists of metallurgical coal sales guidance of approximately 701,000 to 721,000 tons and thermal coal sales guidance of approximately 911,000 to 941,000 tons. The coal sales guidance for 2014 in Corsa’s Management’s Discussion and Analysis for the three months and six months ended June 30, 2014 was 1,700,000 tons which consisted of metallurgical coal sales guidance of approximately 830,000 tons and thermal coal sales guidance of approximately 870,000 tons. The metallurgical coal sales guidance changed due to a reduction in expected export orders and the thermal coal sales guidance changed due to a revised customer delivery schedule. In order to make a strong and stable coke for steel companies’ production of iron, low volatile coal is a necessary ingredient in the sensitive coal blend required. The NAPP Division’s metallurgical reserve base consists entirely of premium rank low volatile coal with favorable pressure characteristics. These unique qualities give Corsa’s metallurgical coal product a secure place in the domestic and seaborne trade. During 2013, Corsa was able to demonstrate the value of its metallurgical coal to domestic and international steel producers. As a result of the positive quality and reliability of its metallurgical coal, Corsa has been awarded supply agreements for 2014 and beyond. In Nine Months 2014, metallurgical coal sales were 401,000 tons. The metallurgical coal sales guidance for the fourth quarter of 2014 is approximately 300,000 to 320,000 tons, from the newly formed combination of Wilson Creek and PBS, of which 100% is contracted and 75% is priced. Corsa also has sales contracts for 150,000 tons in 2015 and 38,000 tons in 2016. Corsa expects to enter into sales contracts for the majority of its 2015 domestic sales volumes in the fourth quarter of 2014, consistent with industry practice. Through the acquisition of PBS, Corsa has gained access to a significant new customer base of both domestic and international steel producers which has diversified its sales mix. Corsa has historically made sales of metallurgical coal to some of the PBS customers but a significant portion of the sales contracts acquired are new customers. Corsa is currently working with these new customers to ensure a seamless transition for the delivery of the contracted sales of PBS and will continue to provide a reliable supply of metallurgical coal in the future. Current metallurgical coal prices are at level where a significant amount of global production is uneconomic. Prices in the domestic metallurgical coal markets for 2014 have fallen from 2013 levels by approximately 10% and prices for export shipments in 2014 have declined approximately 21% from 2013 levels. As a result, a significant portion of the global seaborne coal production is being produced at a loss, a situation that many view as unsustainable. Producers have responded to these conditions and have increasingly shown supply discipline, announcing production cuts of approximately 20 million metric tonnes of production so far this year. We believe the impacts of these cuts will take effect in 2015. Settlements on 2015 domestic metallurgical coal sales are starting to take place. Export pricing has been very competitive due to oversupply, particularly from Australian mines, and a weaker Australian dollar. Corsa is well positioned to take advantage of logistics to the domestic market with its close proximity to coke producers on the river systems easily accessed by truck or rail through Pittsburgh. Corsa’s low volatile product is highly sought after for its low pressure quality. Access to seaborne trade via a short rail distance to the Baltimore export terminals solidifies Corsa’s ability to participate when seaborne pricing is attractive. Corsa’s CAPP Division production is sold into the Utility and Industrial markets for the production of electricity. The CAPP Division reserve base exclusively consists of high BTU and high carbon content coal. These unique qualities set CAPP Division apart from other producers and create a niche in the Utility and Industrial marketplace. During 2013 and in Nine Months of 2014, Corsa has been successful is demonstrating to the utility consumers the value, consistency and quality of CAPP Division thermal production. Corsa will continue to increase its sales focus on the Industrial market during the remaining three months of 2014 and into calendar year 2015. Total sales of thermal coal in the Nine Months 2014 amounted to 691,000 tons. While the thermal coal market continues to outpace demand 2014, Corsa has been successful in maintaining a high level of contracted sales for the future. In 2015, Corsa’s CAPP Division production is 72% contracted. The thermal coal sales guidance for fourth quarter of 2014 is approximately 220,000 to 250,000 tons, of which 100% is contracted and approximately 100% is contracted and priced at an average of $67. Corsa also has sales contracts in place for 650,000 tons in 2015, 500,000 tons in 2016, and subject to mutual agreement, and 500,000 tons in 2017. Current Southeastern US utility market Thermal coal pricing has declined 5% over the course of 2014. As a result, much of the Central Appalachia coal production is uneconomic. Corsa expects Utility coal demand for Central Appalachia production to decrease in 2015. Conversely, Industrial Thermal demand grew 4% year over year for 2014. Corsa expects Industrial demand to grow 1% in 2015. Management uses Adjusted EBITDA, Cash flow from operations, Realized price per ton sold and Cash production cost per ton sold as internal measurements of operating performance for Corsa’s mining and processing operations. Management believes these non-GAAP measures provide useful information for investors as they provide information in addition to the GAAP measures to assist in their evaluation of the operating performance of Corsa. Reference is made to the Management’s Discussion and Analysis for the three and nine months ended September 30, 2014 for a reconciliation of non-GAAP measures to GAAP measures. Refer to Corsa’s unaudited Condensed Interim Consolidated Financial statements for the three and nine months ended September 30, 2014 and 2013 and related Management’s Discussion and Analysis, filed on www.sedar.com and posted to Corsa’s website www.corsacoal.com, for the details of the financial performance of Corsa and the matters referred to in this release. Certain information set forth in this press release contains “forward-looking statements” and “forward-looking information” under applicable securities laws. Except for statements of historical fact, certain information contained herein relating to projected sales for the year ended December 31, 2014, including price and demand, and constitutes forward-looking statements which include management’s assessment of future plans and operations and are based on current internal expectations, estimates, projections, assumptions and beliefs, which may prove to be incorrect. Some of the forward-looking statements may be identified by words such as “estimates”, “expects” “anticipates”, “believes”, “projects”, “plans”, “outlook”, “capacity” and similar expressions. These statements are not guarantees of future performance and undue reliance should not be placed on them. Such forward-looking statements necessarily involve known and unknown risks and uncertainties, which may cause Corsa’s actual performance and financial results in future periods to differ materially from any projections of future performance or results expressed or implied by such forward-looking statements. These risks and uncertainties include, but are not limited to: risks that the actual production or sales for the 2014 fiscal year will be less than projected production or sales for these periods; risks that the prices for coal sales will be less than projected or expected; liabilities inherent in coal mine development and production including restarting idled mines; geological, mining and processing technical problems; inability to obtain required mine licenses, mine permits and regulatory approvals or renewals required in connection with the mining and processing of coal; risks that Corsa’s coal preparation plant will not operate at production capacity during the relevant period, unexpected changes in coal quality and specification; variations in the coal mine or coal preparation plant recovery rates; dependence on third party coal transportation systems; competition for, among other things, capital, acquisitions of reserves, undeveloped lands and skilled personnel; incorrect assessments of the value of acquisitions; changes in commodity prices and exchange rates; changes in the regulations with respect to the use, mining and processing of coal; changes in regulations on refuse disposal; the effects of competition and pricing pressures in the coal market; the oversupply of, or lack of demand for, coal; inability of management to secure coal sales or third party purchase contracts; currency and interest rate fluctuations; various events which could disrupt operations and/or the transportation of coal products, including labour stoppages and severe weather conditions; the demand for and availability of rail, port and other transportation services; the ability to purchase third party coal for processing and delivery under purchase agreements; and management’s ability to anticipate and manage the foregoing factors and risks. The forward-looking statements and information contained in this press release are based on certain assumptions regarding, among other things, coal sales being consistent with expectations; future prices for coal; future currency and exchange rates; Corsa’s ability to generate sufficient cash flow from operations and access capital markets to meet its future obligations; the regulatory framework representing royalties, taxes and environmental matters where Corsa conducts business; coal production levels; Corsa’s ability to retain qualified staff and equipment in a cost-efficient manner to meet its demand; and Corsa being able to execute its program of operational improvement and initiative to realize cost synergies following the completion of Corsa’s acquisition of PBS. There can be no assurance that forward-looking statements will prove to be accurate, as actual results and future events could differ materially from those anticipated in such statements. The reader is cautioned not to place undue reliance on forward-looking statements. Corsa does not undertake to update any of the forward-looking statements contained in this press release unless required by law. The statements as to Corsa’s capacity to produce coal are no assurance that it will achieve these levels of production or that it will be able to achieve these sales levels.